Unfolding in chapters, Nathaniel Kahn's My Architect records both an emotional, very personal search and an authoritative biopic. The subject: the filmmaker's own father, the renowned Philadelphia-based architect, Louis I. Kahn. Although the elder Kahn completed only a relatively limited number of commissions in his career, his legacy and influence still resonate today throughout the architectural world. Most will recognize his timeless building for the Salk Institute for Biological Studies in La Jolla, California, while his Phillips Exeter Academy Library in Exeter, New Hampshire, and Yale Center for British Art in New Haven, Connecticut, are staples of discussion in many art history classes. Nathaniel was drawn to his father's story as a subject for many years. He first approached it as a fictional script but quickly realized that he didn't know enough about his father, or their relationship, to write about it. As the film reveals at the outset, Louis died unexpectedly in 1974 when Nathaniel was only 11. But more importantly, he had lived a double, perhaps even triple life, fathering two children with two different women, while still married. He never married Nathaniel's mother, nor did he live with them. All his families were united only once: at his funeral. Filmmaker Kahn began the documentary not knowing what he would find. "The film itself is record of that process," he explains. "It is a real journey; it really took five years." Part of the travail was approaching such a personal subject, but also the realities of documentary funding, particularly for a first-person, highly subjective narrative. Grants eventual came from the Philadelphia Foundation, the Pew Charitable Trusts, the Harry and Jeanette Weinberg Foundation and others. Kahn started out telling the story in an academic, third-person voice, with the intent of putting his father's career into context. To that end, he interviews many of the greatest living architects, such as Philip Johnson and I.M. Pei, as well as architectural historian Vincent Scully. But the film became more personal as shooting progressed. He elaborates: "I got more courage, not so much to put myself in it, but to use my real voice, not my reverential fake voice, which I'd always had around things that had to do with my father." As the son retraced his father's steps, collecting pieces of him by visiting his buildings in chronological order of completion and meeting with his parent's contemporaries, there came a turning point. During an interview with one of his father's former colleagues, Jack MacCallister, in the corridors of the Salk Institute, Nathaniel learned that his father had spent Christmas holidays with MacCallister and his family. Immediately, cameraman Bob Richman turned to Kahn and recorded his reaction in a spontaneous, real and devastating moment. "It's all over my face," he says of his feelings of regret. "I didn't put myself in the film, but the subject required a reaction from me and Bob put me in." Kahn credits not only Richman, but his other collaborators, editor Sabine Krayenbuhl and producer Susan Behr, for helping him realize a mature perspective of his father. "What was so difficult for me was finding in myself the ability to be angry with my father, even after all these years, because it was never an emotion I felt it as a child," he explains. Behr helped him ask the hard questions of his father's choices. "The ability to push me towards emotions, I clearly felt, but didn't have words for, was something Susan brought to [the film]," Kahn maintains. After editing an interview with the filmmaker's mother, Harriet Pattison, Krayenbuhl suggested that Kahn re-interview her, that he hadn't gone far enough in his first interview. She is the only interviewee to appear twice in the film. Kahn found the second interview one of the hardest to complete; he also shot it himself, which adds to the intimacy of the encounter. "I knew at some point the film would bring me into some kind of conflict with my mother," Kahn relates. "The story I was told as a child, through the evidence of the film itself, doesn't necessarily add up. I'm not saying it's wrong; I'm only saying, it's part of the story. I leave it as an open question and allow the audience to wonder." Throughout the feature documentary, the elder Kahn's buildings are richly explored and strikingly photographed, through a number of lyrical, 16mm time-lapse exposures. However, My Architect isn't just for the architecture or design crowd. The director sought to tell the story for every child who missed out on knowing his father. One of the essential things Kahn found was that his father always bet on himself; he compares that to what a documentary maker does: "It's not about pleasing a huge demographic." Rather, it's the essence of artistic expression: "I got something in here that has to come out; I'm going to sacrifice a great deal for it; I'm going to fight very hard to make it happen." The life of an architect and the path of a documentarian have many similarities, Kahn discovered. "In both professions, so many things conspire to make a building or a film less than what you dreamed," he theorizes. Whether it's a lack of funds or the sheer amount of time it takes to complete a commission––providing one earns one)––many forces work against architect and filmmaker. There has to be a motivating factor other than just money. Both require a great deal of passion from their makers. Great films, like great buildings, take time. architect Kahn's Capital Complex at Dhaka, Bangladesh, took 20 years and was finished 10 years after his death. Architecture has become much more immediate and emotional to Kahn. "After studying my father's journey through life, what gets me is the human effort and struggle behind these buildings," he explains. Once Kahn learned about his father's buildings, he could see his father's personality in them. Although the architecture is most often described as serene or monumental, Kahn found certain details truly romantic. Having worked previously in short films and on environmental documentaries, Kahn makes his feature-length debut with My Architect. Films that influenced him and challenged him to be a filmmaker include Akira Kurosawa's The Seven Samurai and Ross McElwee's Sherman's March. From both he learned that filmmaking is broad and malleable; more significantly, both films created an emotional response, changing the way he saw the world. My Architect premiered in April 2003 at the New Directors/New Films series in New York City. Festival stops have included the Full Frame Documentary Festival; the Philadelphia Film Festival, where he earned the Audience Award; the inaugural Silverdocs Festival, where he took Best Documentary Feature honors; and the Seattle Film Festival. New Yorker Films, in association with HBO/Cinemax Films, is distributing the film in the United States. By stepping in front of the camera, Kahn essential becomes a character in his film. Viewers come to know both him and his father—and his father's architectural legacy. 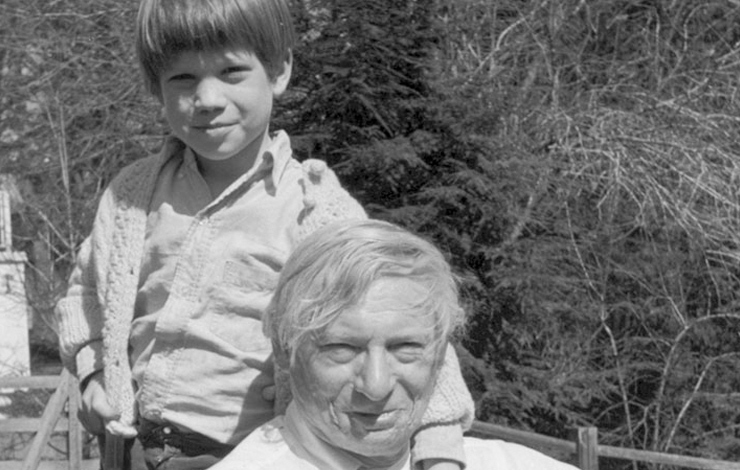 Through the creation of the documentary, Kahn came to understand much about his father, musing that it was better than therapy. "The process itself is a way of getting to know someone or something," says Kahn. "The act of going with the camera gives you the license to ask questions a child would ask: Tell me about my father?" By making the film, Louis is much more present for Nathaniel, whose feelings are no longer fixed, but shift the way they might with a living person. "The father that was in my mind when I began was a myth; the father that is in my mind and heart now is a man," he maintains. "It's heartbreaking on a daily basis, but also uplifting." Kahn's own struggle to make My Architect led him to a fundamental connection with his father, a man who dedicated his life to his art. He considers one archival image in the film as the most powerful and telling: "The most active image in my mind now is when he's drawing and you see charcoal on his fingers. My father has become a man with charcoal on his hands to me. He became real, through making the film."